Tene Sommer and Lexland law office lawer Daniel Leon are Blackmailing 5,000.00 euro! 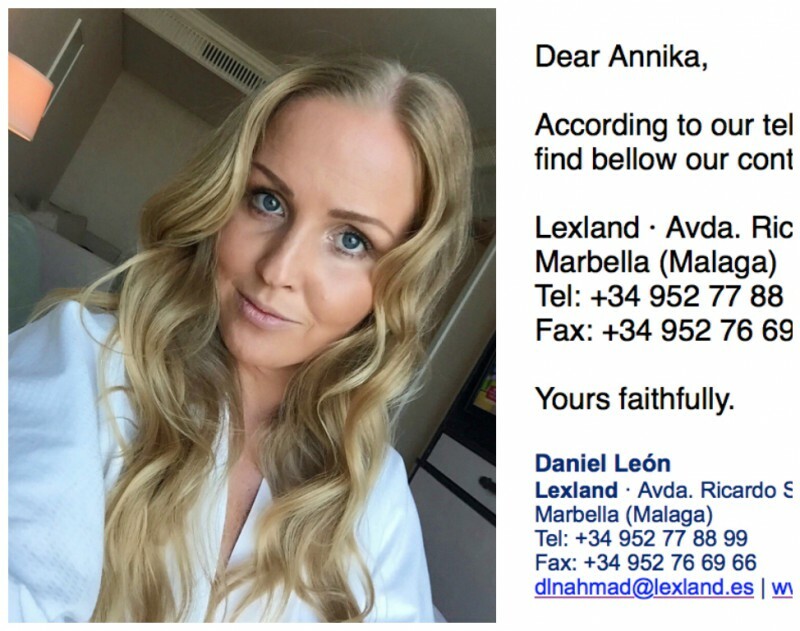 Tene Sommer and Lexland law firm are blackmailing Annika Urm for 5,000.00 euros. 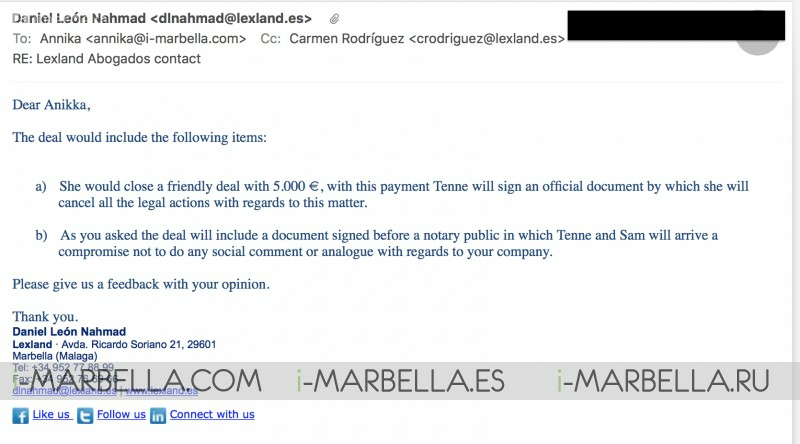 Tene Sommer and Lexland law firm have tried to blackmail Annika Urm and i-Marbella for 5,000.00 euros. Employers, beware of Tene Sommer! Tene Sommer worked as a journalist, translator and assistant at the online magazine i-marbella. From 2010-2014 she was a self-employed entrepreneur. At the same time, she worked as a social media editor for Puente Romanos Beach Resort and Spas La Suite Social Media, as well as singing and performing among other different jobs. In October 2014, Sommer announced that she would no longer be working at i-marbella. Sommer never returned the resources, information nor work equipment that belongs to the company Urm owns. Sommer turned to Daniel Leon, a lawyer at Lexland law firm, to claim compensation from Urm, stating that Sommer had worked for i-marbella for so long. They claimed 16,716.00 euros from Urm over the phone and in writing, later offering to accept a compromise of 5,000.00 euros. Neither did Annika Urm or i-marbella agree to this since it was pure extortion. Neither Urm or i-marbella agreed to this because it was a pure extortion. You need to be extremely careful with Tene Sommer and Sam Cameron because they are masters at extorting everything from their employer while doing as little work as possible. You definitely should not engage into work contract or collaboration, what so ever with them. They do tend to hold grudges and be vindictive. Also, Tene Sommer sent her sister Triin Sommer to take part in an Estonian TV broadcast in 2016 to say that Tene Sommer was claiming money from Annika Urm in the Spanish courts. That was a false statement because no evidence was presented to the court and it could not be verified. Tene Sommer tried to get money twice. She already got money by Estonian law.